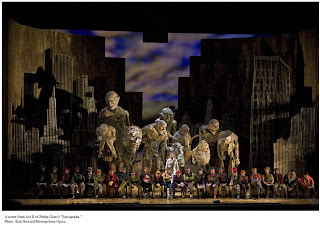 Last month I attended one of the most amazing nights of my life: The Metropolitan Opera's production of Philip Glass's Satyagraha. What follows are some notes, thoughts and meditations on the production and the experience. 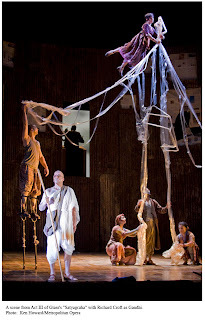 For those unfamiliar with this, Glass and his librettest, Constance DeJong, took sections from the great ancient Indian epic, the "Baghavad Ghita" and fashioned a dramatic presentation about Ghandi in his South African years. The result is one of the most powerful, artistic (without being "arty") works of American music of the last century. The work is sung in its ancient Sanskrit text, which puts some off, but with the nature of Glass's powerfully hypnotic score, serves to illuminate the texts both beautifully and brilliantly. So . . . read on, if you dare! 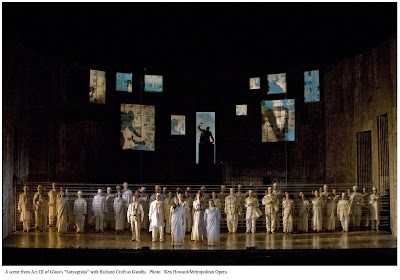 I was stunned how packed and difficult it was to get into the Met last night for the prima of Glass's "Satyagraha." The house was packed and althouth told it hadn't sold out I spied not a single empty seat The production by English National Opera is listed oddly in the program book and a genuine team effort with the scenery by Rene Marchal, amazing lighting by Kevin Sleep "properties by ENO" but it's hard to figure out who served as the actual production head. Regardless of such confusion the phyysical production is one of wonder with 20 foot tall puppets, some created right before your eyes of newspapers, papier mache and, seemingly little more than light. The entire stage was framed - surrounded by a circular wall of what appeared to be corrugated metal from which panels of myriad sizes could open - Advent calendar-like - to provide entrances, exits, visions. At the top right - left and center were three outsized panels - one for each of the acts which, once opened, were entered into (by climbing upon ladders), the central character for whom the act is named: Tolstoy, Tagore & M.L. King, Jr.. Tolstoy and Tagore enter as members of the ensemble, and then dressed, and bearded by other ensembel members, King, costumed before us THEN climbing the ladder. Each, silently, almost dolcile-like dominates the scenery. This was a difficult call, with the King character - occupying the center panel, felt a little too static and, for a while (and too long) took one's attention away from the stage as, standing at a podium silently renacted his famous "Dream" speech. At first, however, this was powerful as images of the masses at the Lincoln Memorial were projected onto all of the panels, then acts of rioting and violence shown, before the entire walled structure disappeared revealing the vast Met stage - now a beautiful sky, great nimbus clouds gently rolling across it. Throughout the production magic would appear before us, transforming everything, the crowds with a team called the Skills Ensemble propeling the action (such as it is) in the role of onlookers AND participants. It really was one of the most stunning productions of anything I've seen. People don't "get" Satyagraha and in several discussions I had I could only explain that I wasn't getting all of what I was seeing either BUT, that was part of the beauty - beholding the wonder of something that is not fully comprehensible to me. I likened it to being as Parsifal in the first Grail Ceremony: awed, but uncertain as to why - The effect being more important than the cause of it. At a pre-curtain dinner (at the amazing Rosa Mexicano) a friend asked: "What kind of mood should I be in for this?" I could only answer: contemplative, open, forgiving? I told h im not to approach it as an opera at all - there is no linear structure as we know it and find (generally) in more standard repertoire works. The music. First of all, debuting conductor Dante Anzolini won the respect and admiration of all present for keeping the score together and adjusting the dynamics in less time then the blinking of an eye - to which the Met Orchestra performed one of the most amazing feats I've heard from any orchestra, responding with remarkable precision and deftness to a score that must be impossibly difficult to perform on many levels. It's no secret I like much of Glass's music and, for me, Satyagraha is his masterpiece. That doesn't mean it's without fault. The first act is the best and the work progressively weakens in each ensuing act - though I still find all of it beautiful, and the final scene is (as it should be) the best music of a very long evening. The choral music for Satyagraha, clearly inspired by eastern modalities and chant is beautiful - almost mind numbingly so. While this may be frustrating (and infuriating) for some, for others - like me - there is a spirituality a "something else" quality that seems genuinely spiritual - even while we're aware we're watching a piece written for the theatre. It was not unlike watching video footage of dervish's whirling during their ceremonies (something else that I can watch for hours) - and which leaves me gape-mouthed in wonder. Pride of place for the singing simply goes to Richard Croft who was present onstage throughout the long night, presenting - with equal parts passion and believability, Ghandi's journey of the spirit. Put as plainly as possible: no singer today moves me as much as Mr. Croft. I've been in love with the work of Richard Croft for a couple of decades now and, having heard him in Handel, Mozart, Debussy, Verdi, Salieri, Rossini and more. His singing last night was as amazing, as moving and, on a purely vocal level - as beautiful as anything I've ever heard from him. Croft also remains one of the finest operatic actors I've seen onstage. In anything. With most singers I'm aware of "who" they are, while they're portraying (even brilliantly so) their characters. Not so Mr. Croft. At the curtain of each of his performances I'm always stunned back into reality - "oh, yeah - it's HIM!" Few singers have had as profound effect on me as Richard Croft did and does. The timbre of his voice, the infinite varieties he can shade text and tone with were put to the test last evening in a long evening where the music depended upon this ability more so than they do, say, in Mozart or in Handel. Even when, as he must in the first act, stand still for 10, 15 minutes his posed gesture grew in intensity and and there is an earnestness in his performance which must be praised. Croft's singing of the final scene - caused me to want to fight crying (I don't know why) but into the third strophe of the aria I gave in, the waterworks just gushed forth as he would move - one measured step at a time, toward us and sang with a sweetness almost impossible to define. In fact, I simply can't. He's a funny curtain call artist - always has been; every performance - even when he gets a roar of cheers - he merely nods a little bow preferring to jump back into line with the rest of his cast. The true team player. Last night, we got a little (not much) more of him as he was clearly and deeply moved by the audience's reaction (which was a deafening roar of screams, bravos and pandemonium) and he clutched his heart, tears in his eyes at the response. The rest of the cast: Bradley Garvin as Arjuna; Richard Bernstein as Lord Krishna, Ellie Dehn - (making an impressive debut), Maria Zifchak, Earle Patriarco, Alfred Walker and Mary Philips all sang with beauty, clarity and precision and that is no small compliment given how devilishly difficult this score must be to perform. After those final notes of Croft's voice and the orchestra simply fade into the house the red show curtain descended and immediately there was some loud, vociferous booing. I could only wonder: who in their right mind would sit through 4 hours of this to boo it? Clearly the only answer is no one. The boos were shortly drowned out by a cheering, thunderous ovation - more bravos shouted than I can recall as cast, conductor, production team and, finally, Mr. Glass came out for their bows. Afterwards (the show ended right at midnight) people stayed, even standing outside in the rain (some of us!) talking about and sharing the experience. Most everyone I spoke with loved it - a beautifuly, emotional night at the Met. Most of us seeming to get what Glass - and this amazing production were trying to say. Bravo to the Met for daring to put this on, for challenging its audiences and helping many new ones discover the beautiful messages of Satyagraha. One can't really ask for more than this. The other night I attended a special “Prelude” concert with the Portland Symphony Orchestra under the direction of its new Music Director, Robert Moody – (technically still Music Director Designate). This (and tonight’s performance) serve as Maestro Moody’s last under the “Designate” designation before he officially begins his reign this summer. Moody strode onstage, a dapper, elegant and boyishly familiar looking figure combining a Robert Downey, Jr. like casual intensity with Ryan Seacrest hair. Every conductor must cultivate his look –it’s part of the job and in this regard, Moody’s unaffected, natural look would appear to suit both him and his audience, well. First up on this 75 minute –intermission-free concert, was a Maine premiere: “Phoenix” for Orchestra by the North Carolinian, Dan Locklair. Composed in 1980 for organ, brass and percussion, Moody, explained to the audience, how moved he was by a performance of “Phoenix” in its original form, and contacted the conductor to see if it could be reworked for full symphony. The result is a work I well imagine will leave audiences elated and cheering, as it did last night. Fanfares by antiphonal brass onstage and also opposite ends of the balcony) introduced a slightly prickly martial theme quickly assimilated into the orchestra. Crisp and lively the piece marches nobly forward assuming a more valedictory air before a soulful – almost folkish melody takes over in the strings. Here, I was put to mind of one of those wonderful British tone poems - where a simple melody serves as the basis for a work that starts off charming before morphing its way into something grander, more stirring. It feels distinctly programmatic, like the very best movie music (and though film music is often used as a “put down” for contemporary music, such is not the case here – I’m talking about film composers in the Shostakovich, Copland, Walton and Britten mold, folks). It is at this point where Phoenix, as its title seems to imply, begins to soar. Soon the full battery of instruments weaves its way through this beautiful theme, before a return of the brass fanfares – the mighty Kotzschmar Organ joining in, Phoenix continues to a glorious finale of awe and majesty. That all of this happens can occur in ten minutes is rather remarkable. Locklair’s orchestration of his own work, works. Big time. The PSO’s performance, with their new young maestro at the helm, quite simply owned the work. It was inspiring watching Moody’s face – an enormous smile ever beaming – and to see members of the orchestra, his orchestra – and ours – smiling in return. A snafu or two in the synchronization of three ensembles notwithstanding, I couldn’t help smiling myself, proud to hear such rich, sweeping beauty and expressiveness of sound coming from “my” orchestra. Stirred as I was by the experience, it was impossible to ignore or resist the few but persistent tears escaping my eyes. Here was this new, young leader challenging himself, his orchestra and audience to go on a journey with him; here, the sonorous, rapturous and heart-on-sleeve emotional playing of the full ensemble - in my favorite hall (well, tied with Carnegie), of a new, inspired score. It was all of these things combining truly “in concert” that provided an experience to stimulate and overwhelm the senses. It’s what I live for. I look forward learning and hearing more of Locklair’s music, and grateful to Moody for introducing him to Portland. Following a brief introduction and a retuning of the ensemble, Moody again took the podium - this time for the evening’s featured attraction: Mahler’s Symphony No. 1, in D: the “Titan.” At the opening of the first movement – with that haunted, air-filled raspy stillness pervading the room - the strings barely making a sound – I realized, immediately, this was as magically hypnotic playing as I'd ever heard from this orchestra. Soon the room was filled with those familiar bird calls, sounds of nature, and folk inspired melody as Moody convincingly coaxed and calibrated Mahler’s built-in F/X from the orchestral fabric. It was done so brilliantly and convincingly for a moment I thought I’d been dropped off in Vienna. Moody’s take on this symphony put me in mind of something I’ve been beginning to imagine or wonder about: the idea of an “American School of Mahler” sound. That is, to say playing of a less severe nature (though no less seriously played) than the mid-to-late 20th century European performances and recordings many or most of us grew up with, but in a style that seems to fully integrate Mahler’s picturesque libretti – closer to (I believe) what the composer, himself intended. One of the things that impressed me most last night about Moody was his ability to control and pace the most difficult transitions - thematic or temporal, holding the ensemble together taut and precise - this, in spite of Mahler’s many wild, mad-dash and virtuostic transformations. Moody exuded genuine confidence in this music and never did one feel hesitation – either in his gestures nor from the players, all seeming to believe in each other. This is a rare, special thing in any ensemble and never to be lightly taken. Not an overly theatrical conductor, Moody nonetheless skimps nothing in his gestures – his motions, signals and direction alternately entrancing, dramatic when necessary, but clear always. Precise, always. In the Mahler this yielded a powerful, dramatic result that Moody and his musicians seemed never to be in question of. It was clear from those hushed, barely heard notes an hour earlier, where this was going. The orchestra seemed reinvigorated, up to every challenge this monumental "Titan" of scores presents. The strings, with their Wagnerian-inspired tremolos, were thrilling, the winds and brass evocatively, skillfully painting the forces of nature Mahler demands. It was as exciting and well played a performance as I can remember ever hearing from this ensemble. I was thrilled by how skillfully Moody balanced the “Many Moods of Mahler”: bucolic, triumphant, noble, tragic, romantic (the Ländler played with wonderful, old-world style portamento), the silly drunken fun of the Klezmer-inspired madness, nothing was skimped on, and all of it was of a piece, none of it felt episodic or disjointed, all feeling as though wedded to the greater whole. That this was happening here, in Portland, with our home team was . . . well, inspiring seems not strong enough a word for it, but it will have to do. Friends, I believe we are in for some remarkable times ahead. Welcome – and thank you, Maestro Moody!